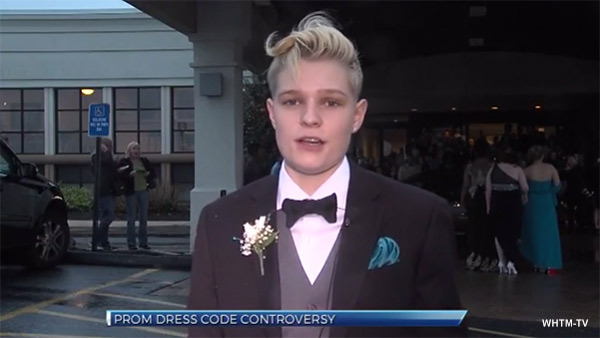 HARRISBURG, Pa. -- A Pennsylvania high school student said she was barred from attending her prom because she wore a suit rather than a dress. Aniya Wolf said she's a lesbian who has worn a shirt and pants for all three years she has attended Bishop McDevitt High School in Harrisburg, according to WHTM-TV. She and her mother, Carolyn Wolf, said the family got a last-minute email saying girls had to wear dresses to attend Friday's prom. Carolyn Wolf said she didn't think the dress code barred her daughter from wearing a suit and the last-minute message was unfair because they had bought a new suit. Aniya said she decided to go to the prom anyway but was thrown out. The school released a statement Saturday saying the dress code was sent to parents three months ago specifying girls must wear formal dresses, and those who didn't follow it would not be admitted. A reminder was sent to all students on March 6, the school said. "Bishop McDevitt will continue to practice acceptance and love for all of our students. They are tremendous young men and women," the school said. "We simply ask that they follow the rules that we have put into place."